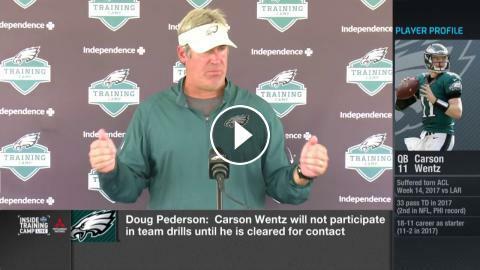 Doug Peterson on Carson Wentz: "I love his enthusiasm, but I'm not going to rush him out there"
Carson Wentz: "I'm not going to change how I play after ACL injury"
Doug Pederson: "I'm very encouraged by where Carson Wentz is in his rehab"
What are the Eagles plans regarding starting quarterback Carson Wentz? Will Eagles QB Carson Wentz pick up where he left off in 2017? Carson Wentz on rehab: "I'm feeling good with where I'm at"
Which QB is under more pressure - Andrew Luck or Carson Wentz? Is it time to jump off the Carson Wentz bandwagon? Doug Pederson on QB Carson Wentz: "I want to make sure he's 100% before making Week 1 decision"
Philadelphia Eagles HC Doug Pederson: "Carson Wentz's offseason rehab is ahead of schedule"
What would it mean for the Eagles if QB Carson Wentz can't play Week 1? How quickly should the Eagles bring along Carson Wentz?